The skin is the largest part of our body and is exposed to the constant influence of the environment. Therefore, proper care is essential. no animal testing, vegan and fast-absorbing herbal body milk. This caring and quickly absorbed body milk was produced without the addition of any chemical preservatives, mineral oils and PEGs. Valuable ingredients such as shea butter, almond and avocado oil as well as a special 6-herb extract made of horsetail, hops, camomile, melissa, mistletoe and yarrow and moisturizing ingredients pamper your skin leaving it soft and supple. 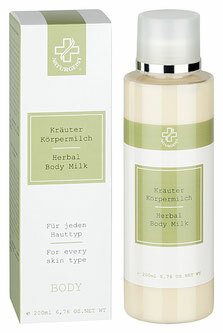 Apply the Herbal Body Milk after showering or bath on your skin. 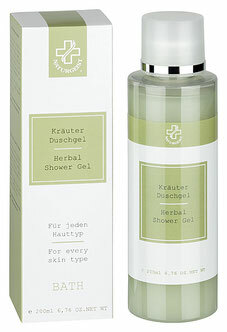 no animal testing and vegan herbal shower gel, gently and refreshingly cleanses your skin. Mild, cleansing and refreshing showergel with natural herb extracts from fennel, hops, melissa, camomile, mistletoe an yarrow with degradable tensides – without dioxane. Also suitable for washing your hair and taking a bath. no animal testing, vegan bath oil for sensitive, irritated and dry skin. Put the product in the hot tub. It creates a nourishing emulsion that cares for your skin. no animal testing, vegan balm oil bath ideal before falling asleep. Calming and relaxing oil bath containing the additives of almond and melissa oil. The perfect bath before going to sleep. For sensitive and dry skin. no animal testing, vegan hand balm protects and nourishes your hands and fingernails. A fast absorbing balm that protects and cares your hands and fingernails. The addition of panthenol to this non-greasy balm prevents from dehydration und puts an end to rough, cracked skin. Apply the hand balm to your hands and nails and massage gently. no animal testing, vegan herbal foot balm, prevents foot burn and foot odor. 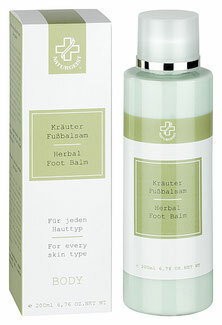 Foot care balm for the daily care of tired feet with herb extracts from eucalyptus, sage, thyme, camphor and rosemary. Protects against aching feet and foot odor. This balm refreshes, prevents cold feet and remature formation of callus. Apply the foot balm to your feet and massage gently. no animal testing, vegan almond oil has an invigorating and stimulating effect on whole-body care. Sun tan lasts longer. Special skin-care oil with the scent of soft, fresh almonds. This valuable body oil cares for your skin by the addition of almond oil, sesame oil and vitamin E.
For all skin type, even for sensitive skin. Apply the Oil Mandola after showering or bathing. Can also be applied to the still moist skin and massaged. The natural oils together with the moisture create a soft emulsion. no animal testing, vegan Vital Gel, the highly effective natural substance is soothing for knees, hip joints and for the back. A beneficial cooling effect is initially felt in the affected areas. This is followed by a deep, pleasant warmth. Apply Vital Gel several times a day, gently and without pressure, and massage in for one to two minutes, then apply a thin layer. Cover, but do not bandage. This gel is made with the addition of natural and plant ingredients. High quality algae, ivy, rosemary and cypress oil. Revitalising; to firm the skin in problem areas. Apply to the problem zones and massage in using circular movements. no animal testing, vegan deodorant spray, well tolerated and discreetly perfumed. extract and a nature-identical bactericide. Without KVO-listed preservatives and aluminum salts.